Banff is a town within Banff National Park in Alberta, Canada. It is located in Alberta's Rockies along the Trans-Canada Highway, approximately 126 km (78 mi) west of Calgary and 58 km (36 mi) east of Lake Louise. At 1,400 to 1,630 m (4,590 to 5,350 ft) above sea level, Banff is the community with the second highest elevation in Alberta, after Lake Louise. The Town of Banff was the first municipality to incorporate within a Canadian national park. The town is a member of the Calgary Regional Partnership. Banff is a resort town and one of Canada's most popular tourist destinations. Known for its mountainous surroundings and hot springs, it is a destination for outdoor sports and features extensive hiking, biking, scrambling and skiing destinations within the area. Sunshine Village, Ski Norquay and Lake Louise Ski Resort are the three nearby ski resorts located within the national park. Banff was first settled in the 1880s, after the transcontinental railway was built through the Bow Valley. In 1883, three Canadian Pacific Railway workers stumbled upon a series of natural hot springs on the side of Sulphur Mountain. In 1885, Canada established a federal reserve of 26 km2 (10 sq mi) around the Cave and Basin hot springs, and began promoting the area as an international resort and spa as a way to support the new railway. In 1887, the reserve area was increased to 673 km2 (260 sq mi) and named "Rocky Mountain Park". This was the beginning of Canada's National Park system. The area was named Banff in 1884 by George Stephen, president of the Canadian Pacific Railway, recalling his birthplace in Banff, Scotland. The Canadian Pacific built a series of grand hotels along the rail line and advertised the Banff Springs Hotel as an international tourist resort. The Banff townsite was developed near the railway station as a service centre for tourists visiting the park. It was administered by the Government of Canada's national parks system until 1990 when the Town of Banff became the only incorporated municipality within a Canadian national park. An Internment camp was set up at Banff and Castle Mountain in Dominion Park from July 1915 to July 1917. The prisoners of the internment camp were used as free labour to build the infrastructure of the national park. In 1985, the United Nations declared Banff National Park, as one of the Canadian Rocky Mountain Parks, a World Heritage Site. Banff remains one of the most popular tourist destinations in Canada. One of the most notable figures of Banff was Norman Luxton, who was known as "Mr. Banff". He published the Crag and Canyon newspaper, built the King Edward Hotel and the Lux Theatre, and founded the Sign of the Goat Curio Shop, which led to the development of the Luxton Museum of Plains Indians, now the Buffalo Nations Museum. He and his family helped organize the Banff Indian Days and the Banff Winter Carnival. In 1976, the International Astronomical Union's Working Group for Planetary System Nomenclature (IAU/WGPSN) officially adopted the name Banff for a crater on Mars, after the town in Alberta. The crater is at latitude 17.7° north and longitude 30.8° west. Its diameter is 5 km (3.1 mi). It is surrounded by mountains, notably Mount Rundle, Sulphur Mountain, Mount Norquay, and Cascade Mountain. The town is above Bow Falls near the confluence of the Bow River and Spray River. Soils are calcareous and usually imperfectly to poorly drained in their natural state with textures from very fine sandy loam to silty clay loam. The sun rises over Banff from a vantage point on the road to Mt. Norquay. Banff experiences a subarctic climate (Köppen climate classification Dfc) that borders on a humid continental climate (Köppen Dfb). Winter temperatures range from an average low of −13.3 °C (8.1 °F) to an average high of −0.2 °C (31.6 °F). Summer temperatures in the warmest month are pleasant with an average high of 21.6 °C (70.9 °F) and an average low of 7.3 °C (45.1 °F). Snow has been recorded in all months of the year. The annual snowfall averages 191.0 cm (75.2 in). The highest temperature ever recorded was 34.8 °C on August 10, 2018 during a great heat wave. The population of the Town of Banff according to its 2017 municipal census is 8,875, a change of 5.4% from its 2014 municipal census population of 8,421. In the 2016 Census of Population conducted by Statistics Canada, the Town of Banff recorded a population of 7,851 living in 2,543 of its 2,729 total private dwellings, a 3.5% change from its 2011 population of 7,584. With a land area of 4.77 km2 (1.84 sq mi), Banff had a population density of 1,645.9121,645.9/km2 (4,262.8924,262.9/sq mi) in 2016. 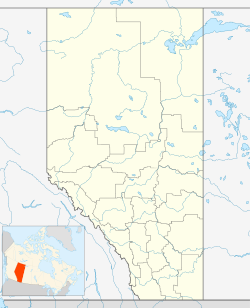 In the 2011 Census, the Town of Banff had a population of 7,584 living in 2,565 of its 2,850 total dwellings, a 13.2% change from its 2006 population of 6,700. With a land area of 4.88 km2 (1.88 sq mi), it had a population density of 1,554.0981,554.1/km2 (4,025.0964,025.1/sq mi) in 2011. Parks Canada enforces requirements that individuals must meet in order to reside in the town, in order "to ensure that a broad supply of housing types are available for those who work and raise families in the community". Summer in Banff overlooking the Bow river. There are a number of popular mountains located immediately adjacent to the townsite which include Mount Rundle (2,949 m or 9,675 ft); Cascade Mountain (2,998 m or 9,836 ft); and Mount Norquay (2,134 m or 7,001 ft). Mount Norquay has a ski slope as well as mountain biking trails on the Stoney Squaw portion. A popular tourist attraction, the Banff Gondola, is available to ascend Sulphur Mountain (2,281 m or 7,484 ft) where a boardwalk (Banff Skywalk) beginning from the upper terminal takes visitors to Sanson Peak. Sulphur Mountain is also the location of one of Banff's most popular attractions, the Banff Upper Hot Springs. Lake Minnewanka located six minutes north of the townsite is a very popular day use area with a variety of activities. Mountain biking, hiking and fishing are all activities allowed in this part of the park. A very popular Lake Cruise, motor boat rentals and a small food concession are available at the marina. Tunnel Mountain (formerly known as Sleeping Buffalo Mountain) (1,690 m or 5,545 ft) is situated within the townsite and is very popular for quick hikes; one can reach the summit in less than half an hour. It was named Tunnel Mountain because surveyors initially wanted to make a tunnel for the Canadian Pacific Railway right through the mountain, instead of following the Bow River Valley. Located on the side of Tunnel Mountain is the Banff Centre for Arts and Creativity, which hosts a number of events including outdoor concerts, dance, opera and theatre. Banff is home to the well-known Banff World Television Festival, Banff Mountain Film Festival, Rocky Mountain Music Festival and Bike Fest. The city is also the starting point of the 4,417 km (2,745 mi) Great Divide Mountain Bike Route, which terminates at Antelope Wells, New Mexico in the United States. Banff and nearby Canmore played host to the 2014 Alberta Winter Games. Banff also hosted the 1991 Winter Deaflympics. For a number of years there has been an annual long-distance relay run between Banff and Jasper, Alberta (formerly known as the Jasper to Banff Relay). In June 2008, the Banff council launched a local bus system called Roam, with three routes connecting the town, Tunnel Mountain, the Banff Springs Hotel, and the Banff Gondola. The service is operated using four hybrid Nova buses, each decorated with scenes from the National Park. There are three separate routes: • Route 1: which goes to Sulphur Mountain • Route 2: which goes to Tunnel Mountain • Route 3: which goes from Banff, to nearby Canmore. Many bus stops along the routes have screens which tell exactly how many minutes before the next two buses arrive. In December 2012, the bus system was expanded to include the Route 3 hourly service between Banff and Canmore. Via Rail's long-distance trains no longer serve Banff, but the Banff railway station remains in use by the Rocky Mountaineer and Royal Canadian Pacific tour trains. The nearest airport to Banff with major service is the Calgary International Airport in Calgary. Acute health care is provided at the Banff – Mineral Springs Hospital. Wikivoyage has a travel guide for Banff. ^ "Location and History Profile: Town of Banff" (PDF). Alberta Municipal Affairs. June 17, 2016. p. 8. Archived (PDF) from the original on September 25, 2016. Retrieved June 19, 2016. ^ "Municipal Officials Search". Alberta Municipal Affairs. September 22, 2017. Retrieved September 25, 2017. ^ a b c "Population and dwelling counts, for Canada, provinces and territories, and census subdivisions (municipalities), 2016 and 2011 censuses – 100% data (Alberta)". Statistics Canada. February 8, 2017. Archived from the original on February 11, 2017. Retrieved February 8, 2017. ^ a b "Alberta Private Sewage Systems 2009 Standard of Practice Handbook: Appendix A.3 Alberta Design Data (A.3.A. Alberta Climate Design Data by Town)" (PDF) (PDF). Safety Codes Council. January 2012. pp. 212–215 (PDF pages 226–229). Archived (PDF) from the original on October 16, 2013. Retrieved October 8, 2013. ^ "Banff, AB - Official Website - History and Heritage". www.banff.ca. Archived from the original on 6 April 2018. Retrieved 28 April 2018. ^ "Internment Camps in Canada during the First and Second World Wars, Library and Archives Canada". Archived from the original on 2014-09-05. ^ "Banff pavilion highlights WWI internment camps". CBC News. Retrieved August 21, 2018. ^ "The History of Norman Luxton – Founder of the Buffalo Nations Luxton Museum". Buffalo Nations Luxton Museum. Archived from the original on 2010-04-12. Retrieved 2013-02-15. ^ "USGS Astro: Planetary Nomenclature: Feature Data Search Results:". United States Geological Survey. Archived from the original on 2006-09-29. Retrieved 2009-04-12. ^ a b c "Canadian Climate Normals 1981–2010". Environment Canada. Archived from the original on 2014-02-27. Retrieved 2013-10-12. ^ "2017 Municipal Affairs Population List" (PDF). Alberta Municipal Affairs. ISBN 978-1-4601-3652-2. Archived (PDF) from the original on January 12, 2018. Retrieved January 13, 2018. ^ "2016 Municipal Affairs Population List" (PDF). Alberta Municipal Affairs. ISBN 978-1-4601-3127-5. Archived (PDF) from the original on June 9, 2017. Retrieved January 13, 2018. ^ "Population and dwelling counts, for Canada, provinces and territories, and census subdivisions (municipalities), 2011 and 2006 censuses (Alberta)". Statistics Canada. 2012-02-08. Archived from the original on 2012-08-17. Retrieved 2012-02-08. ^ Canada, Parks Canada Agency, Government of. "Eligible residency". www.pc.gc.ca. Archived from the original on 28 March 2018. Retrieved 28 April 2018. ^ "Roam". Town of Banff. Archived from the original on 2013-02-08. Retrieved 2013-02-15. ^ "Roam in Banff,". Bow Valley Regional Transit Services Commission. Archived from the original on 2013-07-29. ^ "Roam". Town of Banff. Archived from the original on 2013-04-24. Retrieved 2013-03-18. 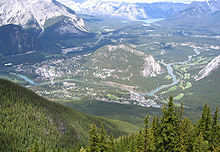 Wikimedia Commons has media related to Banff.